Nikon Coolpix P7800 Manual is aimed to fulfill the needs toward information of both technical or instrumental issue among this digital camera product especially for Nikon Coolpix P7800. Nikon Coolpix P7800 is the successor to Coolpix P7700, the main addition being a 921K-dot electronic viewfinder with 100% scene coverage and a new LCD screen with an RGBW design. This model has a 12.2MP BSI-CMOS sensor and a 28-200mm equivalent zoom lens, a relatively long telephoto reach in this class. Full 1080p video is offered, along with 8fps continuous shooting and a fully articulated 3.0 inch LCD. Nikon Coolpix P7800 is also Wi-Fi ready, and can be equipped with the optional WU-1a Wireless Mobile Adapter to share still images and videos with iOS and Android smart devices using Nikon’s free Wireless Mobile Utility app. When Nikon Coolpix P7700 was firstly released to the market? How much the price when Nikon Coolpix P7800 firstly released? Nikon Coolpix P7700 is a good choice for anyone who wants an easy to use camera that delivers good-looking pictures with pleasing color and plenty of resolution. It was announced by Nikon on September 5, 2013. In the first release, The Nikon Coolpix P7800 pricing set at about $550.00 body-only. Now, if you’re interested to own this compact digital camera device, you can get it in several online stores by paying for the used products about $455.00 of the Nikon COOLPIX P7800 12.2 MP Digital Camera with 7.1x Optical Zoom NIKKOR ED Glass Lens and 3-inch Vari-Angle LCD. digital camera especially of Coolpix P7800 models. Read this manual thoroughly before use, and keep it where all those who use the product will read it. 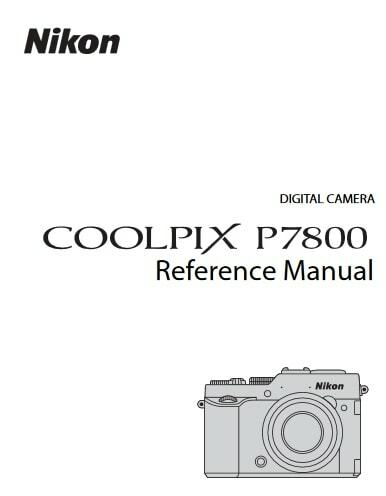 Feel free to download the nikon coolpix P7800 manual user guide at below.